The annals of Hollywood cinema are filled with scores of unsung directors who directed front-line motion pictures in their heyday but whose names are often overlooked today. Talented craftsmen such as Michael Curtiz, Victor Fleming or Robert Wise might still have their primary works known to a general audience, but their names have somehow tended to slip silently from the public's grasp. One great director from the past who is almost criminally neglected today is Anthony Mann, a filmmaker whose body of work should garner far more name recognition than it does at present. Perhaps one reason that Mann is uncelebrated today is that some of his greatest films have a sweeping, landscape-fixated style that translates poorly to the small screen. While his career includes some excellent film noirs, large-scale epics and even a fine musically-inclined biopic of bandleader Glenn Miller, it's the rugged, majestic westerns that offer the best evocations of the director's talent. In these films, the sprawling, rough beauty of America's West is as much a part of the stories as the characters are themselves; harsh mountains and crumbling rocks act as backdrop for dark psychological tales more harrowing and insightful than the average genre piece. The best of these star Jimmy Stewart in roles far less sympathetic than his usual fare, and one in particular (The Naked Spur) casts the actor in an especially brutal mode. In this brilliant film, Stewart tosses aside the wholesome persona that he brought to the Capra-corn on which his reputation was built, and instead plays a hard-bitten bounty hunter on the trail of killer Robert Ryan. He has partners in this venture, but once they catch the smooth-talking criminal they begin to turn against each other. Also along for the ride is Janet Leigh, in a fine turn as a woman traveling with the wanted man. The explosive interactions between these five characters unfold amongst a ravishing setting of Technicolor wonder; the director works in tandem with cinematographer William C. Mellor to create a work where the exterior visual geography often mirrors the inner psychology of the tormented characters. 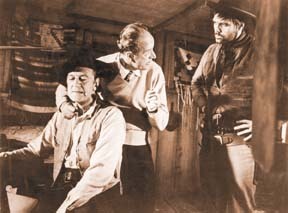 As previously mentioned, however, it is not only in the arena of the western where the director excelled, though in addition to the five Mann-Stewart collaborations, he also helmed high-quality productions like Devil's Doorway (a 1950 production that is far more sensitive to the sad history of Native Americans in the West than many westerns) and Man of the West (with a standout cast that includes Gary Cooper, Julie London, Lee J. Cobb and Jack Lord) during his career. But also impressive are his earlier, more claustrophobic little crime films, such as Border Incident, Raw Deal and T-Men. These are tight, sometimes violent cheapie post-war noirs that demonstrate an economy of means in their direction and flash the talent that would later flourish in better-funded enterprises. These later works that Mann oversaw once he graduated from the B-movie circuit encompass a number of genres, from war movie to grand historic tale to biographical study. The most successful film that he ever made was The Glenn Miller Story, a workmanlike depiction of the famous musician's life that was a rousing box office success in 1953. The impressive scale of the few epic stories that were undertaken by the director during his Hollywood tenure also bear noting, as they display his great artistic skill in handling somewhat grandiose material that has tripped up many a lesser director. Both El Cid and The Fall of the Roman Empire succeed in carrying off the broad strokes of their narratives without veering too often into the tedious trap of "importance" that this type of film often attempts to attain. Also of interest in the assessment of Anthony Mann's directorial output is his work on Spartacus, a film generally solely attributed to the much more renowned director Stanley Kubrick. But in fact, it was Mann who directed much of the first hour of the film before run-ins with star Kirk Douglas forced him out, and the discerning viewer can note some stylistic differences in the parts directed by each esteemed artist. Even though many of Mann's movies would be best experienced on the big canvas of a movie-house screen, the death of repertory film houses throughout the world renders this unlikely for most viewers. Luckily, though the impact of his use of landscape is lessened substantially by the transition to television, the movies are interesting enough in their own right to make them well worth viewing in this medium. To that end, interested readers should avail themselves of the opportunity to take in the Mann westerns that will be showing as a part of Turner Classic Movies' mammoth tribute to the genre this month, a list of which follows this piece. All of the films that are playing are perfect examples of the rough-hewn, tumbledown nature of Mann's filmic style, and additionally there is little doubt that The Naked Spur stands right up there among the greatest movies ever created in this category. Also, on top of this month's generous cable offerings of the works of the filmmaker, many of his other works are still available on videotape or DVD for the public. It's a good thing, too, for though the name of their director has been slightly shrouded by the vagaries of history, these extant artistic creations are still as important and worthwhile now as they were the day they were made. Today, Anthony Mann's top-notch lifetime work is ripe for rediscovery; a talent as magnificent as this one should never be overlooked for too long and has earned the right not to be simply left to obscurity forever.